Athlete Profile: Courage, Determination, & FUN! 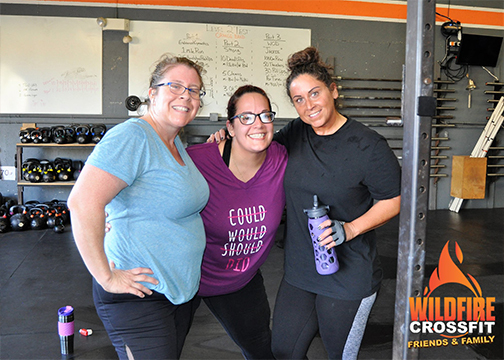 - Nicole P.
When we started the Boot Camp at WildFire CrossFit over 3 years ago, we had no idea how that would work with the rest of the WildFire Community. Even though we have always known that anyone can do CrossFit, there are still people today who hear the word “CrossFit” and immediately feel intimidated. Or, they talk to a friend, who’s sister’s boyfriend’s dog did CrossFit once and couldn’t walk again. The Boot Camp is designed to help people begin their fitness journey in a fun and safe environment with a focus on creating a positive lifestyle through fitness and nutrition. Many of our current members began in the Boot Camp and, especially in its current format, has been a way to get people ready for what we do in CrossFit. 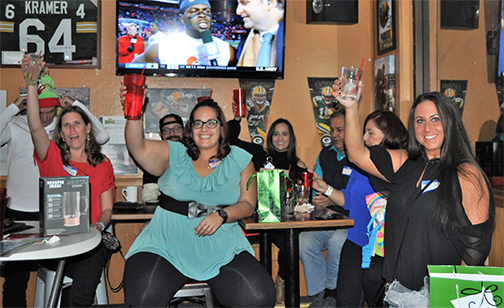 One of those former Boot Campers just celebrated their 2-year anniversary at WildFire in February. She is one of those people who lights up the room when she comes in, friendly and outgoing, and has come such a long way since she started, even if she is back in a boot. 😊 While we talk a lot about how awesome our current members are at welcoming new members into the gym, she takes it to the next level, often offering to partner up with people who look a little lost and intimidated, and helping them through their first couple classes. A loud and proud New Yorker from Long Island, Nicole Paolantonio did 2 Boot Camps before transitioning into CrossFit. She’d been wanting to move out of New York for a while and after a visit to a friend who had moved here, she got a job and moved here just a few weeks later. With a bachelor’s degree in Business Management and a Paralegal Studies Certificate, you can’t put anything past her as she is a Team Leader and Anti-Money Laundering Quality Control Analyst. According to Nicole, that “basically means [she] reviews activity in bank accounts to ensure that customers aren’t doing shady things with their money”. Like many people, she spent years paying for a gym membership she never used. Then, before her first Boot Camp, Nicole went to a local EOS gym “a couple of days a week”. She explained that even though she “was motivated to move forward in [her] fitness journey, [she] found [herself] getting so bored at EOS and never really knowing what exercises to do or if [she] even had good form on the ones that [she] did”. When I asked Nicole how she found out about WildFire, she said, “One day Boot Camp showed up on my Facebook feed and it caught my interest because all the images and videos were of “normal” people. Not already fit, athletic people that you see in other boot camp or gym advertisements. I went from making every excuse why not to go to the gym to turning down happy hour invites because it conflicts with my gym schedule”. That’s music to our ears and we love how dedicated Nicole has been from the very beginning making WildFire a home away from home. She sets a great example to other members with her no excuses and never quit attitude. In fact, she consistently applies the lessons she learned during Boot Camp into CrossFit. According to Nicole, “through learning the power of words (RAS statements), understanding that a journey really does start with one step, and realizing that it is okay to fail, and it is okay to have some “bad days” as long as you pick yourself up and carry on” are just a few lessons we see her applying to this day. When I asked Nicole, what made her start CrossFit after Boot Camp, she explained that she “had so much fun doing Boot Camp, made so much progress, and made so many wonderful connections that [she] couldn’t image not continuing on with CrossFit. Without the amazing community available through Boot Camp and WildFire as a whole, [she is] not sure [her] growth would have happened”. This is exactly why we started the Boot Camp at WildFire, to help people begin that journey and be a part of something bigger than just themselves”. Like most athletes, Nicole continues to set goals for her success. 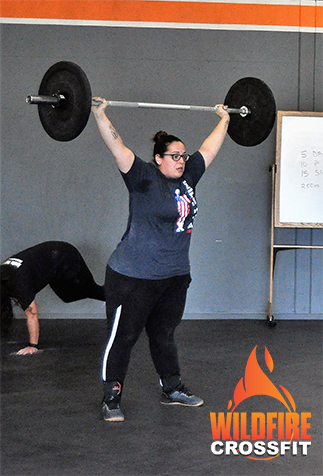 Last summer, she set a goal of getting a 300# 1 rep max Deadlift and she beat it by hitting 305#! She said, “if you would have told me years ago that I would pick up that much weight [her Deadlift started at 175#], I would have laughed at you”. It just goes to show how much hard work, dedication, and a positive attitude pays off! It’s no surprise that Deadlifts are one of Nicole’s favorite exercises, along with Clean & Jerk and Rowing. And, while she’s not a big fan of Thrusters, or Turkish Get Ups, or Curtis P’s, or Man Makers, or… 😊, Nicole says “It’s doing the exercises or workouts that you like least or aren’t as strong in that push you forward”. We couldn’t have said it any better! Aside from a 350# Deadlift, 150# Squat Clean, and increasing her stamina & endurance, Nicole’s main goal is to be “healthy and happy for a long time” and to keep doing CrossFit. In addition, she wants to “understand [her] body and its limits” and know when to go heavier, faster, and harder, and when to “take a step back”. She understands that it’s more important to keep moving consistently, and even with a injury, there is still a lot that she can do. While disappointed that just before the open she had to go back into a boot after a stress fracture in her foot, she was determined to find a way to participate. This is what it’s all about. It doesn’t matter if you need to modify exercises, or even scale the scaled competition, it’s about participating with your community, cheering others on, challenging yourself to be better, and having a lot of fun along the way! 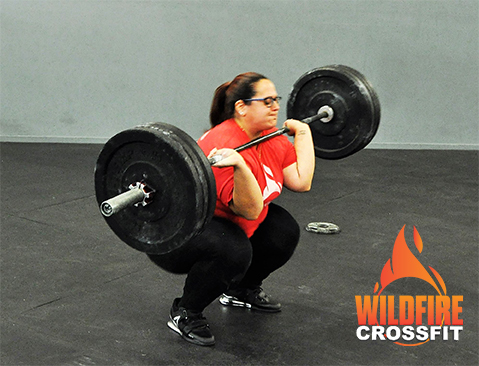 Nicole embodies what the Open is all about at WildFire CrossFit! Even with her injury, Nicole decided to do the Open this year “because of the amazing experience [she] had last year”. She went on to say, “not only did I do movements and use weights that I had never used before, I was able to witness other athletes push themselves and do things that they have never done before. The energy and spirit during the Open are not something that can be described, it needs to be experienced”. Thanks Nicole, for being an awesome example for everything we do and what we are all about at WildFire. Your courage, passion, and determination are a huge inspiration to everyone around you. Keep on pushing yourself outside your comfort zone and motivating and cheering for the people around you. That is what is going to make your goals happen, and we know you are going to get there and beyond!